Chapathi / chapati making is an art. Chapati or roti is a simple and healthy Indian flatbread made of wheat flour which is paired along with curry recipes or served along with the main meal or can serve as wrap or sandwich. Kids love to have chapathi sandwiches for their snack box. It is very easy to make chapati rolls or chapati sandwiches for tiffin also. Making Soft Chapati at home will be the main problem for most of us. So here is my detailed video showing how to make soft and perfect Chapati at home. 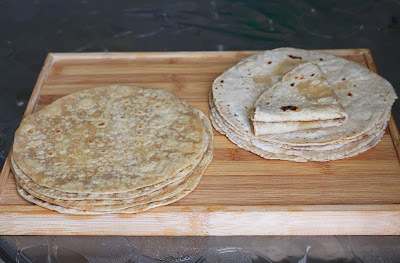 By following this recipe you can easily store the flattened chapati for weeks so that you can cook Chapati instantly easily without any mess. Boil one and a quarter cup of water and once it starts boiling add salt. Mix well and add one cup of flour to the boiling water. Immediately switch off the flame. This step is very important. Do not mix at this stage. Mix very well until the flour is well combined with the water. Immediately transfer it to a tray or a plate and knead it well when it is hot. You must knead it very well for getting soft and puffed Chapathi. Make the dough as soft as you can. Don't be tempted to add flour even if it is sticky. Knead until it comes together. You can roll the dough and flatten it immediately. No need of keeping the dough for resting. Make small equal balls out of this dough. Then keep it covered with a wet cloth. In this method am rolling the chappathi using rice flour. This prevents the chapathi from sticking together when they are stored for later use. You can also make thin chapati easily when rolled in rice flour. Now using a rolling pin and rolling board flattens the chapati using less flour. Please keep in mind to flatten the chapati along the sides. Make sure all sides are proportional. Storing the flattened chappati - you can store the flattened chapati in an airtight container for later use. For this cover the flattened chapathi using a wet kitchen towel and keep it in an airtight container in the refrigerator. So that you can cook them instantly without any mess. Cooking Chapati - Chapati must be cooked on a high flame which is very important. Heat a pan. Make the flame to high and place the flattened side of the chapati up. Cook it and flip when small bubbles start to appear. Flip the chapati once only. It will puff immediately. Transfer the cooked chapati to a plate and cover the plate which prevents the chapati from drying up. Serve along with chicken curry or spicy fish curry. Super soft Chapati is ready. You can even keep this cooked chapati for a day in the room temperature.